Elon Musk unveiled his underground transportation tunnel on Tuesday, allowing reporters and invited guests to take some of the first rides in the revolutionary albeit bumpy subterranean tube — the tech entrepreneur's answer to what he calls "soul-destroying traffic." Guests boarded Musk's Tesla Model S and rode along Los Angeles-area surface streets about a mile away to what's known as O'Leary Station. The station, smack dab in the middle of a residential neighborhood — "basically in someone's backyard," Musk says — consists of a wall-less elevator that slowly took the car down a wide shaft, roughly 30 feet (9 meters) below the surface. "Traffic is soul-destroying. It's like acid on the soul," he said to guests who snacked on marshmallow treats and hot dogs and hoped for a turn in the tunnel. On Tuesday, he explained for the first time in detail how the system, which he simply calls "loop," could work on a larger scale beneath cities across the globe. Autonomous, electric vehicles could be lowered into the system on wall-less elevators, which could be placed almost anywhere cars can go. The cars would have to be fitted with specially designed side wheels that pop out perpendicular to the car's regular tires and run along the tunnel's track. The cost for such wheels would be about $200 or $300 a car, Musk said. Musk dismissed concerns such as the noise and disruption of building the tunnels, saying that when workers bored through the end of the test tunnel the people in the home 20 feet (6 meters) away "didn't even stop watching TV." 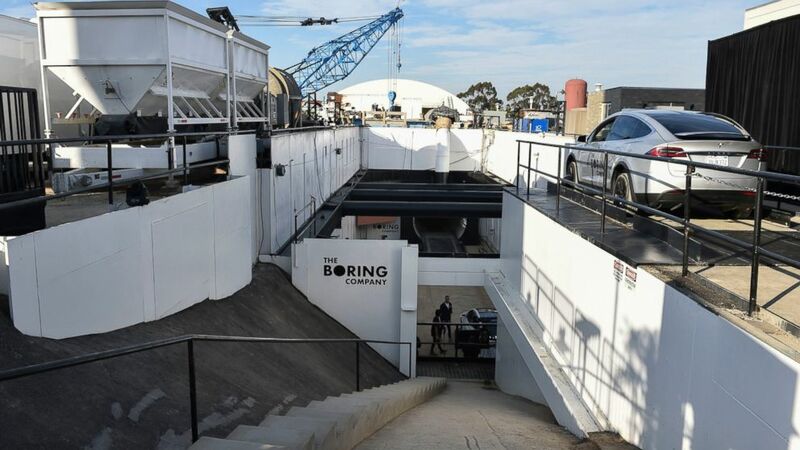 The Boring Company canceled its plans for another test tunnel on Los Angeles' west side last month after a neighborhood coalition filed a lawsuit expressing concerns about traffic and disruptions from trucks hauling out dirt during the boring process. Musk's representatives also unveiled on Tuesday a new tunnel-boring machine they say they hope to have online soon, one that can bore four times faster than the one they've been using. The tunnel will not be open to the public for the foreseeable future, Musk said, adding that regulations wouldn't allow for it to open widely for demo rides just yet. Musk's vision for the underground tunnels is not the same as another of his transportation concepts known as hyperloop. That would involve a network of nearly airless tubes that would speed special capsules over long distances at up to 750 mph (1,200 kph), using a thin cushion of air, magnetism and solar power.